For three decades, J.D. Power has conduced the annual Vehicle Dependability Study (VDS). It measures what has gone right and what has gone wrong with 3-year-old vehicles during the 12-month period of time prior to the survey, according to tens of thousands of original owners of those cars, trucks, SUVs, and vans. J.D. Power gathers and analyzes this data, and publishes the findings in the VDS. From this information, J.D. Power also creates Vehicle Dependability scores that help consumers to understand the overall findings contains within the VDS, and to compare vehicles in terms of this important metric. These scores help consumers make the best decision when selecting a vehicle. This guide includes the most dependable 2016 model-year pickups, according to the 2019 VDS. They receive a score of 8, 9, or 10 on a 10-point scale, and are listed in alphabetical order. Chevrolet kept it relatively simple when it came to the 2016 Colorado. You chose between an extended cab and a crew cab; picked Work Truck, LT, or Z71 trim; and selected a 2.5-liter 4-cylinder, a new 2.8-liter turbo-diesel 4-cylinder, or a 3.6-liter V6 engine. After that, decisions about 4-wheel drive and a longer bed for the crew cab version were the only ones to make. In 2016, in addition to the new turbo-diesel engine, which delivered up to 7,700 pounds of towing capacity thanks to its 181 horsepower and 369 lb.-ft. of torque, the Colorado got an improved infotainment system with Apple CarPlay. The 2016 Chevrolet Colorado receives a Vehicle Dependability score of 8 out of 10. Chevrolet’s full-size half-ton pickup truck got an unusually extensive freshening just two years after a complete redesign. Highlights included revised styling, upgraded infotainment systems, more driver assistance and collision avoidance technologies, enhanced cargo functions, and a new 8-speed automatic transmission for top trim levels. 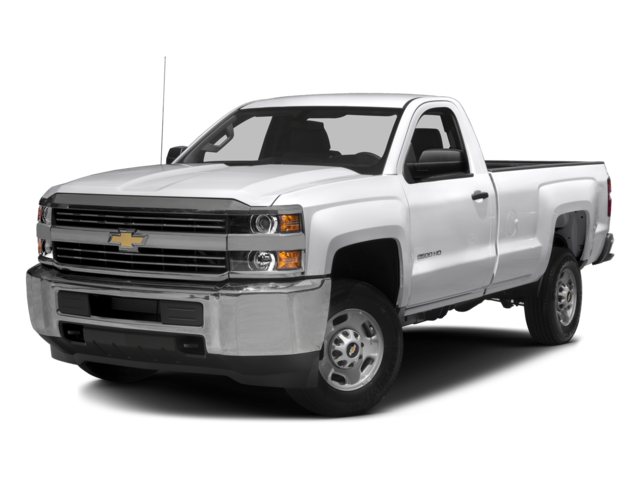 Like other trucks in its segment, the 2016 Chevrolet Silverado 1500 was offered in a dizzying array of cab, bed, and drivetrain combinations, and trim levels ranging from basic Work Truck to luxurious High Country. The 2016 Chevrolet Silverado 1500 receives a Vehicle Dependability score of 9 out of 10. One year after a complete redesign, the Silverado 2500 and 3500 heavy-duty pickups gained improved infotainment systems with Apple CarPlay and Android Auto, wireless smartphone charging, a remote locking tailgate function, and new Digital Steering Assist technology. Tow ratings were changed to conform to SAE J2807 standards, the maximum number now 23,200 lbs. As long as the Silverado HD will tow or haul what you want it to, you’re going to find one configured the way you prefer. Multiple cab styles, trim levels, and drivetrains were available, along with a couple of bed sizes and single- or dual-rear-wheel axles. The 2016 Chevrolet Silverado Heavy Duty receives a Vehicle Dependability score of 9 out of 10, and receives an award in the Large Heavy Duty Pickup category. Ford changed the full-size, light-duty pickup truck game with the redesigned 2015 F-150, which employed an aluminum body to save weight and increase efficiency. Naturally, in 2016, the truck saw few changes, but the ones Ford made were significant. First, Ford swapped in its much-improved Sync 3 infotainment system. Second, it added a luxurious new Limited trim level. Third, it debuted a new Pro Trailer Backup Assist system lauded by people who actually use their trucks to tow. The 2016 Ford F-150 receives a Vehicle Dependability score of 8 out of 10. By the 2016 model year, Ford was putting the finishing touches on a completely redesigned replacement for the aging F-Series Super Duty that would arrive for 2017. As such, it comes as no surprise to learn that this full-size, heavy-duty pickup was essentially unchanged. Original owners of the truck selected between two engines, three cab styles, and five trim levels. When equipped for maximum capability, the F-350 could tow up to 26,500 lbs. The 2016 Ford F-Series Super Duty receives a Vehicle Dependability score of 8 out of 10. A midsize pickup with rugged good looks, the 2016 GMC Canyon was sold in base, SLE, and SLT trim with a choice between extended and crew cab configurations and three different engines driving the rear or all four wheels. The big news for the 2016 model year was a new 2.8-liter turbo-diesel 4-cylinder engine making 181 hp and 369 lb.-ft. of torque, which boosted the Canyon’s towing capacity to 7,700 lbs. Other available engines included a 200-hp 2.5-liter 4-cylinder and a 305-hp 3.6-liter V6. The 2016 GMC Canyon receives a Vehicle Dependability score of 8 out of 10. Among midsize pickup trucks, the Nissan Frontier took home the dependability award in the 2016 VDS. The reason why is probably as simple as the fact that the 2016 Frontier is basically the same as the 2005 Frontier. In other words, it’s been around for so long that all of the bugs were resolved long ago. For example, for 2016, all Nissan did was add a few new paint colors and include a sunroof as standard equipment with SV trim. Otherwise, the Frontier was the same as it’s always been, available in extended- and crew-cab formats, with a 4-cylinder or a V6 engine, and with rear- or 4-wheel-drive. The 2016 Nissan Frontier receives a Vehicle Dependability score of 8 out of 10, and receives an award in the Midsize Pickup category. With V6, V8, and turbo-diesel engine choices, multiple cab and bed configurations, and a slew of standard trim levels and special edition trim packages, the 2016 Ram 1500 full-size light-duty pickup truck offered variety in addition to dependability. Ram didn’t change the 1500 much for the 2016 model year. New colors, special-edition variants, LED cargo box lighting, and a more useful standard center console summarized the updates. Notably, Ram claimed it was the most fuel-efficient half-ton truck for 2016, thanks to the available EcoDiesel 6-cylinder engine. The 2016 Ram 1500 receives a Vehicle Dependability score of 8 out of 10. Built in Texas, and in 2016 a decade-old design, the Toyota Tundra was the most dependable full-size, light-duty pickup in the 2019 VDS. Trim levels ranged from basic to luxurious, and buyers chose between two V8 engines, three cab styles, and three bed lengths. For 2016, Toyota improved the infotainment system, added a standard trailer braking control system, installed a bigger gas tank as standard equipment for some models, and offered a more off-road-ready version of the luxurious 1794 Edition trim level. The 2016 Toyota Tundra receives a Vehicle Dependability score of 10 out of 10, and receives an award in the Large Light Duty Pickup category.